ELMORE — Woodmore had just one more hit and both teams committed three errors, but Hopewell-Loudon took advantage of its better overall pitching and work at the plate Thursday to claim a 16-5 win. Just one of the four runs scored off H-L’s Travis Milligan in three innings was earned, with Milligan fanning five, allowing no walks and scattering six hits. Reliever Owen Schumm allowed just two hits, two walks and an earned run in two innings of work. Meanwhile, the Chieftains drew 18 walks — Jaret Nelson and Connor Roush both picked up four and Cody Balliet added three — to go with their seven hits. The baserunners bore fruit, with Nelson ending with four runs and an RBI, Milligan scoring three times, and Balliet, Ethan Oswalt, Rousch and Peyton Burns scoring twice. Milligan and Balliet also each singled twice and drove in three runs, Oswalt had two singles and two RBIs, Gage Burns doubled and chased in two runs, Marshall Reinhard scored and Bailey Breidenbach knocked in a run. BELLEVUE — Shelby used a pair of four-run frames and held Bellevue in check in the eighth Thursday to claim a 10-6 win. 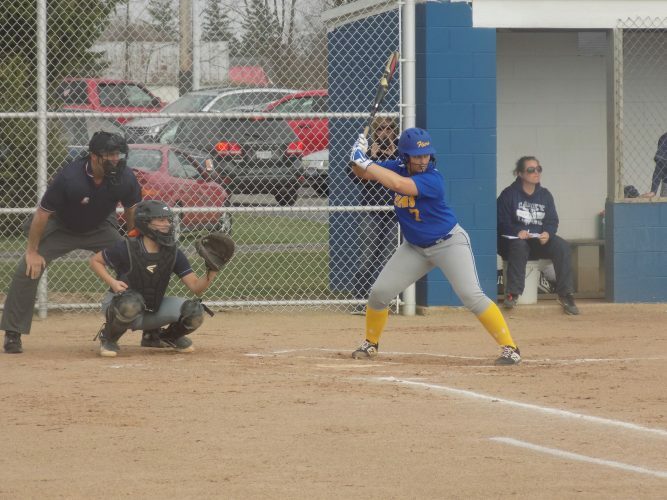 Bellevue snapped a 2-2 tie with three runs in bottom of the fourth, but the Whippets countered with a four-run burst in the top of the sixth. The Redmen tied the game again in the bottom of the sixth and neither team scored in the seventh. In the eighth, McQuire Albert doubled in two runs to fuel another four-run surge for Shelby and the defense stranded two Bellevue runners on base in the bottom of the inning to get Evan Bogner the win. Just two of the six runs scored against Bogner were earned. Albert also singled in a run and scored twice, and Caden Payne, Blaise Caudill, Marshall Reinhard and Nathan Zehner each singled. Payne added two runs and an RBI, Caudill drove in a run, and Shephard and Zehner both scored. Austin Gray singled twice and scored, Marek Albert and Bogner both singled, scored and drove in a run, and Blaine Bowman scored. Keegan Ray took the loss for Bellevue. Starter Garrett Vickery allowed six runs in 5 2/3 innings, but only two of them were earned. Phillip Putnam drove in two runs with a double and single, Dalton Hay scored twice and doubled and Brad Miller doubled, singled, scored and knocked in a run. Vickery singled twice, Ethan Prenatt and Jacob Montgomery both singled and scored, Ray singled, and Trey Ruhlman had a run and RBI.